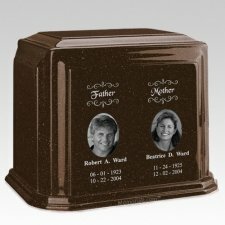 The Millennium Chocolate Companion Marble Urn is made from cultured marble material. It is an exquisite urn and even used as urn vault, perfect for home display or burial. A great urn for your loved one. "This pendant is beautifully crafted. Impressive, no one knows what it actually is until I tell them, they are surprised and want more information about it. I feel very comfortable having my mom with me, and close to my heart."